The 31st International Congress of Actuaries 2018 in Berlin was successfully completed! With more than 2,700 participants, the ICA 2018 has been the most visited ICA in the history of all ICAs and we are indescribably happy that everything went as planned! 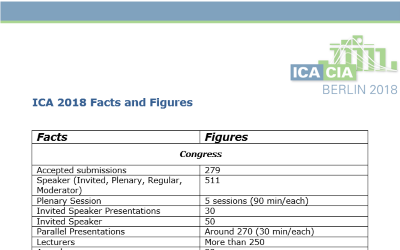 Since there are many facts and figures, surrounding such big event, we have created a ‚Facts and Figures‘ sheet which can be found here, including significant numbers regarding the ICA 2018.